← RPK takes on the Chinese: You should stop trying to prove you are stupid! Celebration! 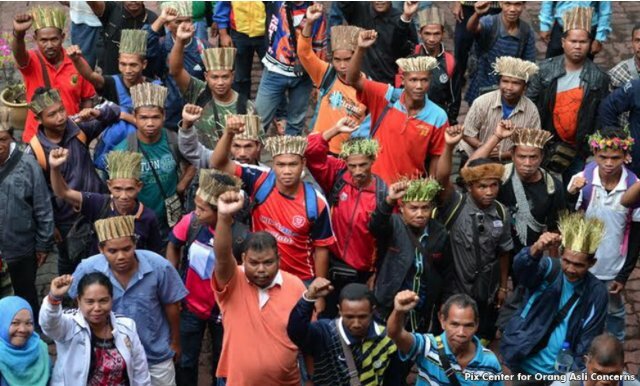 Four Orang Asli acquitted by Court is a Time of Joy! In this first customary land rights case of customary law, the Temiar are arguing that their lands cannot be given away without compensation, if they have customary land rights. They are represented by S. Yogeswaran. Today marks the first day of hearing for the land rights case of the Temiar Orang Asli of Pos Belatim, Kelantan, against the state government and the director-general of the state’s land and mines. This is after the Court of Appeal ordered a retrial of the case almost two years ago. Today’s hearing saw two representatives from the seven villages of Pos Belatim – Angah Along from Kampung Chermal and Hassan Alang from Kampung Belatim – giving their evidence before the judge at the Kota Bharu High Court. Lawyer S Yogeswaran, representing the Temiar, said three more witnesses from the applicants’ side will provide their evidence at the next hearings on August 15 and 16, as well as on August 24 and 25. Three witnesses from the Kelantan state government are also expected to provide their evidence. The Temiar had filed the application to court, stating that they have customary rights under customary law. This is after the Perbadanan Pembangunan Ladang Rakyat Negeri Kelantan entered into an agreement with another party to develop the land, but the Temiar were not happy as the project had encroached on their lands. This entry was posted in Uncategorized and tagged first customary land rights case of customary law, malaysia, politics, temiar orang asli versus kelantan govt. Bookmark the permalink. 1 Response to Temiar Orang Asli versus Kelantan Govt at the Kota Bharu High Court.